(1) Boycott: This term refers to a coordinated boycott of particular corporations or individuals (e.g., entertainers, artists, and athletes), in an effortto intimidate and coerce them to break off their business relationships with Israel. In December 2009, the British government issued an official recommendation urging business owners to label Israeli products manufactured in West Bank settlements as such, so that consumers wishing to boycott those items could easily identify them. In May 2012, the Migros supermarket chain in Switzerland announced that beginning in mid-2013, it would label all Israeli products originating from the West Bank as such, rather than as having been “made in Israel.” “We want to ensure transparency, so that the customer can decide if he wants to buy the product or not,” said a Migros spokesperson. Also in May 2012, the South Africa Department of Trade and Industry announced that products originating from Palestinian-controlled areas of the West Bank would be labeled as such, and not as Israeli products. That same month, Denmark’s foreign minister said that he, too, planned to permit supermarkets to place a special label on goods originating from West Bank settlements. In November 2015, the European Union likewise decided to start labeling Israeli products made in the West Bank, a move that was condemned by Israel and praised by Palestinian Authority President Mahmoud Abbas. (3) Sanctions: This term refers to the effort to convince governments around the world to take punitive actions—such as trade penalties or bans, arms embargoes, and the severing of diplomatic ties—against Israel specifically. In addition to its boycott-, divestment-, and sanctions-related activities, BDS’s principal hallmarks also include “direct action” measures like “humanitarian aid” flotillas, “die-ins,” mock checkpoints that portray Israel as an authoritarian fascist state, mock “apartheid walls,” and well-coordinated demonstrations and protest marches held primarily in European cities and on North American college campuses. BDS is not a formalized, centrally controlled movement, but rather, a non-hierarchical network composed of many radical activists and scores of anti-Israel NGOs. Some of these NGOs are Palestinian entities, others are Israeli, and still others are based in Europe and North America. Among the more influential NGOs that support and promote BDS are: +972 Magazine, Addameer, Al-Haq, Al-Mezan, the Alternative Information Center, the American Friends Service Committee, Amnesty International, the Applied Research Institute–Jerusalem, BADIL, Boycott from Within, Bread for The World, Broederlijk Delen, the Canadian Catholic Organization for Development and Peace, Christian Aid, the Coalition of Women for Peace, Cordaid, DanChurch Aid, Defence for Children International–Palestine Section, Diakonia, the Ecumenical Accompaniment Programme in Palestine and Israel, Electronic Intifada, the Gaza Community Mental Health Programme, Grassroots Jerusalem, the Holy Land Trust, Human Rights Watch, IKV Pax Christi, the Interchurch Organization for Development Cooperation, the International Federation of Human Rights, the International Solidarity Movement, the Israeli Committee Against House Demolitions, Jewish Voice for Peace, Kerk in Actie, La Asociación para la Cooperación en el Sur (The Association for Cooperation in the South), Machsom Watch, Medical Aid for Palestinians, MIFTAH, Mossawa, the Norwegian Refugee Council, the Palestinian Agricultural Relief Committees, the Palestinian Center for Human Rights–Gaza, the Palestinian NGO Network, Sabeel, Stop the Wall, Students for Justice in Palestine, Trocaire, War On Want, Who Profits, and Zochrot. In the early 20th century—decades before Israel even came into existence as a sovereign state—universities in Europe and the U.S. imposed official and unofficial limits on the number of Jews they would admit. In the 1920s, Arabs in the British Palestine Mandate began to boycott the pre-state Jewish Yishuv in an effort to discourage Jewish immigration to that region and thereby prevent the creation of a Jewish homeland. In August 1922, the Fifth Palestine-Arab Congress exhorted all Arabs to refuse to sell land to Jews, or to patronize Jewish businesses. In 1929, this boycott was extended to encompass all Jewish-made products. Two years after that, the Arab Workers Committee published a comprehensive, itemized list of specific Jewish goods that Arabs in both the Middle East and the West should boycott. In 1937, an Arab Congress meeting in Syria passed motions calling for the nullification of the Balfour Declaration—a 1917 British government document that endorsed the creation of a Jewish homeland in BPM—and advocating an economic boycott of Jews. In December 1945 the fledgling Arab League announced a collective boycott stating that all Arab “institutions, organizations, merchants, commission agents and individuals” should “refuse to deal in, distribute, or consume Zionist products or manufactured goods.” “Jewish products and manufactured goods shall be considered undesirable to the Arab countries,” the measure added. Over time, the Arab boycott expanded to target also foreign companies doing business in Israel; e.g., a boycott against Coca-Cola in 1966 caused the product to be removed from supermarket shelves throughout the Arab world. With the brief improvement in Arab-Israeli relations following the Madrid and Oslo peace initiatives of 1991 and 1993, respectively, many Arab countries relaxed their boycott efforts against the Jewish state. Meanwhile, Israel launched new economic relationships with Arab nations in the Gulf, and the fledgling Palestinian Authority established economic and business ties with Israel. But after peace talks broke down in the summer of 2000, Arab calls for boycotts against Israel began to re-emerge. And by early autumn, the Palestinians had launched their Second Intifada, a relentless wave of terrorism whose hallmarks were Fatah and Hamas suicide-bombing assaults. Throughout the first half of 2001, Arab states continued to lead a majority of the anti-Israel boycott activities that were taking place around the world. Participation in these boycotts broadened dramatically, however, in the aftermath of the United Nations’ famous “World Conference Against Racism, Racial Discrimination, Xenophobia and Related Intolerance” (WCAR). Held in Durban, South Africa from August 30 through September 8, 2001, this event was crucial in laying the foundation of a global BDS campaign against Israel. The WCAR featured, most prominently, an NGO Forum that focused a hugely disproportionate share of its attention and condemnation on the alleged transgressions of Israel and the United States. Members of the Palestinian Committee for the Protection of Human Rights & the Environment—also known by the acronym LAW (Land And Water)—were on the Conference steering committee and played a key role in narrowing the focus of both the NGO Forum and the overall Conference mainly to Israel, America, and the Jews. As NGO Monitor puts it, the World Conference Against Racism was a watershed moment in the early development of the so-called “Durban Strategy” of “delegitimizing Israel as ‘an apartheid regime’ through international isolation.” Many NGOs continue to promote this “delegitimization” agenda by publishing distorted, misleading and false allegations of Israeli “war crimes,” “ethnic cleansing,” and “apartheid”; organizing anti-Israel provocations such as flotillas and violent demonstrations under the guise of humanitarian aid and human rights; and targeting Israeli-affiliated businesses with protests and flash mobs. Another significant expression of both the Durban Strategy and the BDS agenda is the use of “Lawfare,” a term connoting a war that is being waged against Israel not on the battlefield, but rather, in the courtroom. We can see lawfare in action whenever anti-Israel NGOs: (a) file lawsuits against companies and governments that do business with Israel; (b) try to persuade courts and international legal bodies to impose boycotts and embargoes on Israel; (c) demand the issuance of arrest warrants against Israeli public officials whom the NGOs accuse of human-rights violations; and (d) lobby for cases to be brought against Israelis at the International Criminal Court. The most prominent NGOs in the vanguard of anti-Israel lawfare campaigns include the Palestinian Center for Human Rights, Al-Haq, Al Mezan, Adalah, BADIL, Defense for Children International–Palestine Section, the International Federation for Human Rights, and the Center for Constitutional Rights. To view a list of some of the more significant lawfare cases that these and other NGOs have initiated over the years, click here. Around the time of the 2001 Durban Conference, campaigns to boycott Israel began to sprout up in a number of Western countries. For example, in July 2001, Member of Parliament George Galloway helped Britain’s Palestine Solidarity Campaign launch the Boycott Israeli Goods (BIG) initiative. The following year, academics from the United Kingdom, United States, France, Morocco, and elsewhere signed a letter affirming their refusal to “cooperate with official Israeli institutions, including universities …[or to] attend … scientific conferences in Israel … [or to] participate as referee in hiring or promotion decisions by Israeli universities, or in the decisions of Israeli funding agencies.” And by 2004, anti-Israel boycotts and protests were commonplace in a number of Western countries, though these events were typically small, localized, and of limited impact. About a year later, in July 2005, PCACBI helped organize more than 170Palestinian NGOs in composing the “Palestinian Civil Society Call For Boycott, Divestment and Sanctions Against Israel Until It Complies with International Law and Universal Principles of Human Rights.” The acronym “BDS” was subsequently adopted from its use in this 2005 document, which stated: “We, representatives of Palestinian civil society, call upon international civil society organizations and people of conscience all over the world to impose broad boycotts and implement divestment initiatives against Israel similar to those applied to South Africa in the apartheid era. We appeal to you to pressure your respective states to impose embargoes and sanctions against Israel.” The explicit reference to apartheid South Africa echoed the language of the 2001 Durban NGO declaration. To view the full text of the 2005 Call For BDS, as well as a comprehensive list of its signatories, click here. The “Democratic Constitution” of the pro-BDS organization Adalah advocates a binational state as the only legitimate path to equality. On the very day of Israel’s birth in May 1948, five Arab armies invaded the nascent Jewish state in what they intended as a war of annihilation. During the fighting, an estimated 472,000 Arabs fled their homes to escape the dangers. They planned on returning immediately after what they fully expected would be an Arab victory and the destruction of the Jewish state. But instead, the Jews repelled the Arab armies and emerged victorious. Nevertheless, the Arab states were determined to carry on their campaign of destruction and they remained formally at war with Israel. In 1950, Jordan annexed the entire West Bank. As a resultof that annexation and the continuing state of war which, with few exceptions, persisted for decades thereafter, the Arab refugees who had fled Israel during the 1948 war never returned. Today BDS activists demand a “right of return” to Israel on behalf of some “5 million” Arab “refugees.” This figure is more than ten times the number of Arabs who actually left the fledgling Jewish state in 1948, because it includes not only those original refugees but also all of their descendants. More than 90 percent of the Palestinians who now reside in the West Bank and Gaza have never lived a day of their lives in territorial Israel, thus their claim of a “right of return” is logically incoherent. But they understand that the incorporation of 5 million Arabs into Israel would render the Jews a permanent minority in their own country, and would thus spell the end of Israel. That is why BDS proponents have made it a fundamental demand. In summation, each of BDS’s three non-negotiable conditions are intended to promote the dissolution of Israel as a Jewish democratic state. 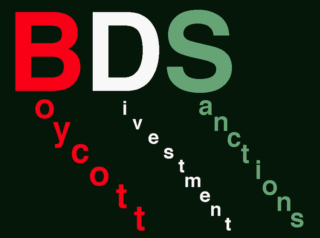 An outgrowth of the 2005 Call For BDS was the Palestinian Boycott, Divestment and Sanctions National Committee (BNC), established in 2007 to coordinate what it terms “the global movement” to inflict economic hardship on Israel, in retribution for its alleged human-rights abuses. Referring to Israel’s creation in 1948 as the “Nakba” (Arabic for “Catastrophe”), BNC contends that “for decades, the Jewish state has denied Palestinians their fundamental rights of freedom, equality, and self-determination.” In 2008 the Committee adopted a strategic position paper that accused Israel of practicing “ethnic cleansing” against the Palestinian people, and of presiding over a political system whose ugly hallmarks included “apartheid,” “occupation,” “colonialism,” and repeated violations of “international human rights and humanitarian law.” For additional information about the BNC and its positions, click here. For additional information on USCACBI, click here. * Another key promoter of boycotts and “nonviolent resistance” against Israel has been Dr. Mustafa Barghouti, who is currently the secretary-general of the Palestinian National Initiative Party. At the turn of the 21st century, Barghouti headed the Palestinian People’s Party (PPP) and served as its representative on the Palestinian National Council (PNC). Under Barghouti’s leadership, the PPP was a signatory to a November 2001 statement by the Palestinian National and Islamic Forces calling for the continuation of the “blessed intifada” and praising the “heroic resistance” of its martyrs who had died while fighting “the Zionist entity.” Also in 2001, Barghouti co-founded Grassroots International Protection for the Palestinian People (GIPP), a program that served as an umbrella group for pro-BDS organizations like the Palestinian NGO Network and the International Solidarity Movement. Students for Justice in Palestine (SJP), which has more than 150 chapters throughout the United States, is the organization most directly responsible for organizing BDS events—like its annual “Apartheid Week” activities—on college campuses. “[SJP’s] status as an official student organization,” reportsNGO Monitor, “makes it eligible for university funding on several public campuses.” These public funds, in turn, are often used to bankroll events and host pro-BDS speakers such as Omar Barghouti, Ali Abunimah, Miko Peled, and Allison Weir. 1. Episcopal Church: Notwithstanding its traditionally low regard for Israel, prior to 2013 the Episcopal Church had never seriously considered participating in an anti-Israel divestment campaign. But in January of that year, a coalition calling themselves the “Episcopal Voices of Conscience” drafted a “Prophetic Challenge” to their denomination’s Executive Council. “Just as this church stood with South Africa and Namibia during the dark days of Apartheid,” said the document, “so we recognize that we need to be standing with our sister and brother Palestinians who have endured an Apartheid that Archbishop Emeritus Desmond Tutu has described as worse than it was in South Africa.” The signatories exhorted the Episcopal Church to “immediately” take measures to ensure that “our financial resources are not being used to support the infrastructure of this suffocating occupation.” When the question of divestment was raised again in 2015, however, the Church rejected it. 2. United Church of Christ: The United Church of Christ (UCC) identifies Israel‘s “occupation” of Palestinian lands as the principal cause of the repeated wars that have “caused a significant number of Palestinians to be displaced from their homes” ever since 1948. In 2005, UCC leadership adopted an “economic leverage” resolution featuring “the use of selective divestment” against Israeli business interests, and called on the Jewish state to “tear down” its West Bank security barrier. That same year, the Church drafted a resolution charging that over the decades, “Israeli governments and Zionist expansionist organizations” had “progressively dispossessed the lands and property of Palestinians, who have maintained an historic presence and retain deep roots in the land.” In 2014, UCC voiced its approval, in principle, of “divestment from companies that profit from the Israeli occupation of Palestinian territories, and [a] boycott of products produced in such territories by Israeli companies.” And in June 2015, UCC’s general synod formally voted—by a margin of 508 to 124—to proceed with its divestment program. 3. United Methodist Church: Early in the summer of 2006, the New York Annual Conference of the United Methodist Church (UMC) commendeddivestment and boycotts against firms doing business with the Jewish state, so as to prevent them from profiting from Israel’s “illegal and violent activities.” Moreover, a resolution from New York United Methodist stated that the “new” Palestinian leadership—i.e., Hamas, which had recently taken control of the government in Gaza—had brought “some renewal of hope” to the prospect for peace in the region, only to have that hope crushed by Israel’s alleged intransigence. In January 2016, UMC’s investment agency announced that it would no longer put any money into Israel’s five leading banks, on grounds that they allegedly failed to meet acceptable standards for sustainable investment. 4. Presbyterian Church: Historically, the Presbyterian Church USA (PCUSA) has had a highly acrimonious relationship with the state of Israel. Indeed, a 1998 Presbyterian Church General Assembly Overture called for a suspension of all American aid to the Jewish state. In July 2004, PCUSA approved divestment measures that targeted “businesses that it believes bear particular responsibility for the suffering of Palestinians.” But in June 2006 the Church adopted a new resolution canceling that call for divestment and pledging, instead, to thenceforth invest only in companies engaged in “peaceful pursuits” in Israel and the Palestinian territories. PCUSA contemplated the issue of divestment again in 2012, but voted it down. In January 2014, PCUSA’s Israel-Palestine Mission Network (IPMN) published Zionism Unsettled, a congregational study guide condemning “the injustice and oppression perpetrated under the mantle of Zionism by the government of Israel against the Palestinian people.” In conjuction with the Presbyterian Peace Fellowship, the IPMN has been one of PCUSA’s leading advocates of BDS. In June 2014, PCUSA’s Committee on Mission Responsibility Through Investment placed three corporations—Caterpillar, Hewlett Packard and Motorola Solutions—on the denomination’s “divestment list.” The trangressions of those companies included the sale of bulldozers, surveillance technology, and other equipment used by Israel to defend itself against Palestinian terrorism. According to a federal complaint filed in 2014 by the legal advocacy group Shurat HaDin, PCUSA has had repeated contacts with the Islamic terror group Hezbollah, which is committed to Israel’s destruction. In October 2004, for example, a delegation of 24 Church officials met with Hezbollah operatives in Lebanon, where PCUSA elder Ronald Stone said during the proceedings: “As an elder of our church, I’d like to say that according to my recent experience, relations and conversations with Islamic leaders are a lot easier than dealings and dialogue with Jewish leaders.” “We treasure the precious words of Hezbollah and your expression of goodwill towards the American people,” Stone added. A year later, another PCUSA delegation met with Nabil Qaouk, a senior Hezbollah commander in Lebanon. When Qaouk complained that U.S. policies in the region were being dictated by Israel, the delegation concurred with him. Among the more influential promoters of BDS are Jewish and Israeli anti-Zionists like biologist Steven Rose and his wife, sociologist Hilary Rose; professor and revisionist historian Ilan Pappé; professor/filmmaker Haim Bresheeth; academic architect Eyal Weitzman; author/environmentalist Naomi Klein; literature professor Judith Butler; and International Solidarity Movement founder Adam Shapiro. Individuals like these seek to provide perceived legitimacy to the global BDS movement by emphasizing that they support it as Jews. The international, Israeli, and Palestinian NGOs that actively promote BDS are supported by hundreds of millions of dollars and euros from governments, religious institutions, and private foundations and donors around the world. European Union members collectively constitute the largest governmental benefactors of these NGOs. The governments of Norway and Switzerland also contribute significant sums of money. Notwithstanding authoritative theological pronouncements like these, relatively few Western Islamist groups have devoted significant energy and resources to BDS activities. A notable early exception was the UK-based Friends of Al-Aqsa. In more recent years, numerous Muslim Students Associations—many with ties to the Muslim Brotherhood—have actively promoted BDS in North America, South Africa, and Europe. By 2011, however, the PA had begun to understand how BDS could actually help to advance Palestinian Authority agendas. As senior Fatah official Nabil Shaath told the Israeli daily Ha’aretz: “We are learning how to co-exist with popular struggle. To tell you the truth, this wasn’t at the beginning in the mind of Abu Mazen [Mahmoud Abbas]. He is gradually starting to see it—popular struggle and international activism. Abu Mazen at the beginning was scared of the idea of BDS. But if you want to put real pressure, this is the way…. The BDS groups meet here in my office…. Unarmed struggle does not mean that I have submitted to Israeli occupation but that I am looking for other ways of making pressure, not armed, not violent. One of them is BDS.” Fatah now supported “the BDS movement all over the world,” Shaath added. And by 2014, three PA ministers sat on the board of directors of the Palestine Economic Policy Research Institute, a BDS-supporting NGO. Seven individuals who currently are AMP officials or are otherwise tied to the organization, were formerly members of groups that were shut down or held civilly liable by the U.S. government for funneling money to Hamas. These include: (a) three individuals—Hossein Khatib, Jamal Said, and Salah Sarsour—who previously belonged to the Holy Land Foundation for Relief and Development (HLF), a Hamas front group that, according to the U.S. Treasury Department, contributed approximately $12.4 million in money, goods, and services to Hamas; and (b) four individuals—Rafeeq Jaber, Sufian Nabhan, Abdelbasset Hamayel, and Osama Abuirshaid—who gravitated to AMP from the Islamic Association for Palestine (which, until its dissolution in 2004, served as the chief U.S. propaganda arm of Hamas). Before joining AMP, Hamayel also had ties to KindHearts for Charitable Humanitarian Development, whose assets were frozen in 2006 by the U.S. Treasury Department because of its fundraising activities on behalf of Hamas. * FDD’s research further shows that AMP’s donor list includes groups and entities whose members, affiliates, or associates maintained ties to various terrorist groups including the Palestinian Islamic Jihad, the Qassam Brigades (the military arm of Hamas), and al-Qaeda. * The top-listed signatory on the 2005 Call For BDS was the Council of National and Islamic Forces in Palestine (CNIF), a BDS National Committee member that was established by Marwan Barghouti and Yasser Arafat in 2000-01, early in the Second Intifada, to coordinate the terrorist activities of Hamas and various nationalist PLO groups. * Several of the signatories to the 2005 Call For BDS were known front organizations for the terrorist Popular Front for the Liberation of Palestine (PFLP). Among these signatories were Addameer, the Union of Health Workers Committees, and the Union of Agricultural Workers Committees (the latter two of which were charities run by PFLP members). * In November 2008, the BDS National Committee (BNC) produced a position paper titled “United Against Apartheid, Colonialism and Occupation: Dignity & Justice for the Palestinian People.” Among the organizations that endorsed this paper was the London-based Popular Resistance Committees (PRC), which is part of Hamas’s European section. Another endorser was the Swiss-based Alkarama for Human Rights, whose president was later identified by the U.S. Treasury Department as a “Specially Designated Global Terrorist” who had helped to fund the activities of various al-Qaeda groups. Excerpted and adapted from David Horowitz, “Why Israel Is The Victim And The Arabs Are The Indefensible Aggressors In the Middle East,” (January 9, 2002).